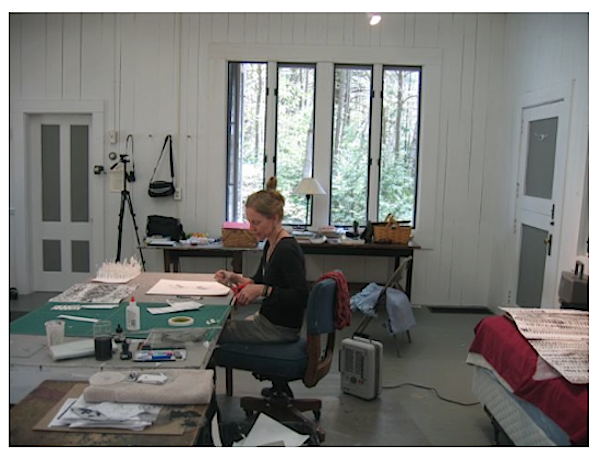 It seems like there are artists who have been on residencies…. and artist who haven’t. For the artists who haven’t, maybe this will help. When I started grad school, and I heard people talking about residencies, it sounded too good to be true. Somewhere out there, there are people who actually want to supply artists with the time and space to get away and produce art. It fit into my post-MFA fantasy: someone would come whisk me away and drop me off in a magical place, surrounded by artists, where all we would do is create, sip coffee, tea, and bourbon, talk about art, and create some more. I didn’t know anybody who had been on a residency, and I didn’t know how to get one myself, but I knew I wanted one. I had to figure it out. Research shows that it’s not luck and it’s not a mystery. The first and most important step in obtaining a residency is applying. Relentlessly. How do you like rejection? Not so much? I know. But if you’re interested in going on a residency, you’re likely to get yourself rejected a good handful of times first. Just like applying to shows, if you don’t have thick skin, and you can’t handle the rejection, it’s going to hurt. A lot. One way I deal with rejections from grants, residencies, and shows is that I apply to things constantly. When you get a rejection letter that starts off with the ubiquitous “There were many great applications… “ (which sounds a lot like someone who’s trying to break up with you by telling you how great you are), it doesn’t hurt as bad because you have other applications out there, so you still have options. But you don’t have to take my word for it. I interviewed three artists who have found success in obtaining residencies, and they have some sound advice. Lauren Boilini was born and raised in Bloomington, Indiana. She received her B.F.A. in Painting and Art History at the Kansas City Art Institute in 2006. In 2008 she completed her M.F.A. at the Mount Royal School of Art at MICA. You can see her new work at School 33 in the Project Space through May 31, 2014. First you need to figure out what kind of residency would be right for you. What are the qualifications? How much time do you have? Do you have the resources? Are you ready to drop everything and devote your time? How do you find out about Residencies? There are some websites that do a pretty good job about listing residencies, but don’t count on them to be comprehensive. New residencies pop up, and old residencies sometimes disappear. I find that resartis.org and collegeart.org are great sites to look for possible residencies. Every couple years teansculturalexchange.org puts on a conference, and if you can squeeze that into your schedule you can actually sit down and show your portfolio to people who run residencies and try to impress them with your wit and charm. What kind of residencies are there? There is not one standard kind of artist residency. Some residencies you have to pay for, some are free, and some even give you a stipend and travel allowance. Some last one week or two, and some are two or three years. (For all you Bmore and DC artists, do yourself a favor and apply to the Hamiltonian Fellowship and Creative Alliance. They’re both amazing extended fellowship programs.) Some of them require you to present your work or give a lecture. Some of them ask that you donate a piece of your work when the residency is done. Some want you to apply with a specific project in mind, and some encourage you to come and respond to the environment. Which residencies are right for you? Well, that depends on you. 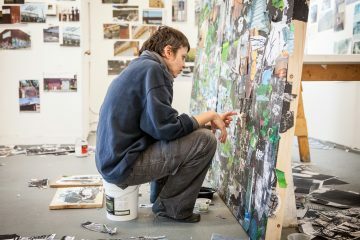 There are residencies that cover a broad range of disciplines, and some that are narrow and specific. If you find one that you think sounds good, before you start the laborious application (and yes, the applications tend to require writing, sometime a lot of writing), and before you shell out the cash to apply, snoop around. Look up the artists who went there, analyze their work to see if you might fit in. Read the residency mission statement, and ask yourself if it sounds like they would be interested in your work. Or do a little e-stalking and look at the website of fellow artists, look at their CVs and check out the residencies they’ve been on. Is it creepy? Maybe. But don’t pretend you haven’t already done that before. If you are an academic, don’t be surprised that summer residencies are more competitive. Many of the people applying are academics who only have time off in the summer. If you can swing different parts of the year, that can be to your advantage. Strong work first and foremost, coupled with thoughtful statement of intent about the work and the residency. A brief description of real need, and what it will provide can be helpful. Work is well photographed or presented (audio, video, etc) with no glitches is a must. Strong references: respected individuals who genuinely know you and can speak about your work and who you are as an artist. 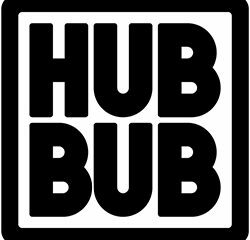 Active record of engagement with community or in shows – respected venues help as well. But if your work is not strong, they won’t be reading this fine print, so important to keep this in mind. Overall – well written, nothing missing and on time. Renee van der Stelt received an M.A. 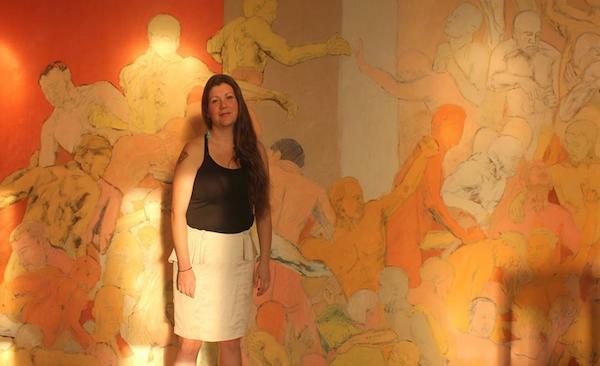 in art history and MFA in drawing and printmaking in 1990 and 1993 from the University of Iowa. 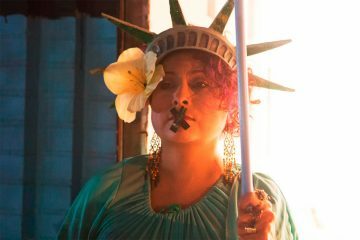 She has worked as museum educator, registrar, curator, and instructor of drawing at various institutions including the Walker Art Center, El Museo del Barrio, and the University of Maryland Baltimore County. Van der Stelt’s drawings and installations have been exhibited at venues throughout the U.S. and abroad. It might not seem fair that writing skills can be the difference between acceptance and rejection, but don’t let that stop you. Find someone who knows how to edit. I can’t stress this enough: don’t send in your application without having someone proofread it for you. Even if it sounds good to you, it’s best to ask a friend to read it without telling them what you want to do at that residency. After they read it, see what kind of questions they have for you. If it wasn’t clear to them, it’s not going to be clear to someone who hasn’t met you. Often what you write is just as important as the images you supply; if you do not have a clear statement and proposal, it’s not going to go well for you. And while we’re on this topic, if your art school didn’t teach you to write coherently and concisely, they did you a great disservice. You’ll be asked to send in images, usually somewhere around 10 or so. If you don’t have quality images, you need to find yourself a photographer friend and work something out; cook them dinner, walk their dog, or beg for help. Get on Photoshop, and fix those colors, crop out anything that doesn’t belong, and make sure your work displays a cohesive body of work. They don’t want to see a Jack-of-All-Trades. They want to see someone who has figured out their ideas and can produce a cohesive body of work. What if you are offered a residency, and you cannot afford it? Odds are that everybody you know knows that you’re an artist, and you’re likely broke (starving artist?). This is where digital panhandling comes in. 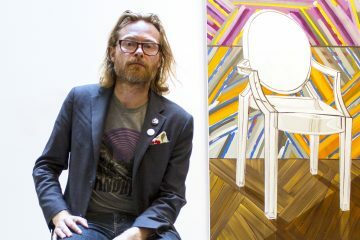 Go check out www.indiegogo.com and www.kickstarter.com, and you’ll find artists gathering money for residencies in exchange for art and thankyous. Don’t feel bad about this. If you pay them back with art, you both win. Few of us have the time in our lives to spend working on art uninterrupted. Life gets in the way. We have work and bills, and our social and recreational lives. But that’s exactly why residencies can be so important. 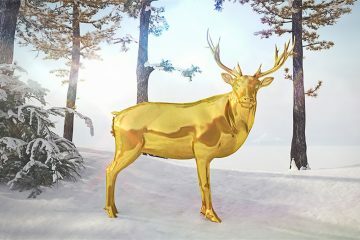 Jonathan Monaghan creates sculpture and animated video installations that challenge the boundaries between the real, the imagined, and virtual. Pulling from wide-ranging sources such as science fiction and baroque architecture, he creates bizarre, yet compelling, 3D environments and stories with the same high-end technology used by Hollywood and video games. 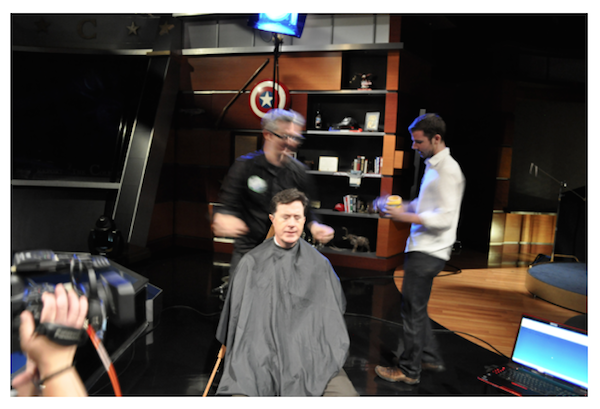 Jonathan Monaghan preparing Stephen Colbert for a 3D head scan…. to launch into space via a balloon. Really. Check it out. If you’re interested in residencies and the opportunity to escape your daily grind to concentrate on your creativity, get to work. Do your research, look them up, put those deadlines on your calendars and don’t let them slip by. Keep all your application proposals so you don’t have to reinvent yourself every time you apply, but don’t let it sound like a canned proposal. Explain why their unique setting and opportunity will be important to you. Don’t let rejection keep you from trying. The first one is the hardest one, but don’t let that stop you. If it were easy you’d be on one right now. 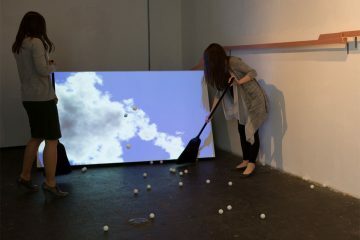 * Author Michael Dax Iacovone is a DC based artist who works in photo, video, maps and installation. His residencies include the Hungarian Multiultural Center in Budapest, Hungary, The Arctic Circle in Svalbard, Norway, MidAtlantic Arts Foundation at West Virginia University, and The Hamiltonian Artist in Washington DC. 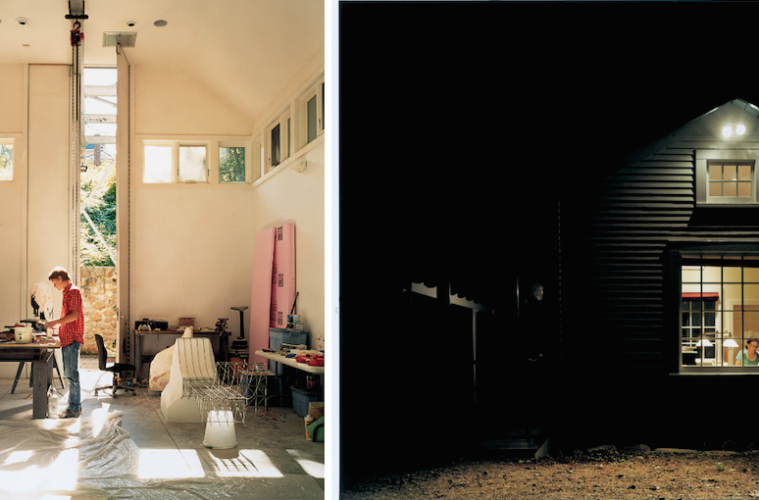 * Featured photo by Victoria Sambunaris for the MacDowell Colony. US + THEM = U.S.
Graham, I think you have just identified the next topic for Mr. Iacovone to research! This would make a lot of sense as a follow up article and I suspect there are as many funding strategies for artists as there are types of residencies. I would be curious to hear straight from artists how they manage to fund their residencies, what financial hardships this causes (if any), and which residencies are free or help fund you. I wonder how professional artists carrying significant student debt manage to afford attending residencies. Even considering a free residency, I’ve struggled with figuring out financing to a) travel to the residency while b) covering my rent at home and c) still earning enough to continue making my student loan payments. This is a riddle I have yet to solve.